Working in customer service requires a specific set of communication and conflict-resolution skills. An employer is aware that in order to fill the positions that interact directly with customers, they must seek candidates with experience and poise. When using video interviews, whether during the screening process or to interview a long-distance candidate, what are some basic questions you can ask to vet your candidates for the best of the bunch? When conducting video interviews, take advantage of using a communication medium similar to a customer service call. For example, is the candidate able to explain themselves clearly and fully, as they would need to when on the phone with a confused customer? Does their voice remain calm and even regardless of if they are nervous, excited, or anxious? On the other hand, a video interview can also give you a sense of how an employee would perform when face-to-face with a customer. Take note of the candidate’s body language and eye contact. Especially when you dive into more difficult questions, do the candidate’s nonverbals change? Do they become visibly nervous or can they remain calm? Particularly when interviewing candidates who will be on the front lines with customers, it is beneficial to dig into their past experience with customer service and try to gauge their reactions to certain situations. For example, ask about a time when they were proud of the service they provided to a customer. Were they promised returning business and loyalty from that customer? Were they able to resolve a difficult and stressful issue for that customer in a unique way? Conversely, ask about a time when they had a negative experience giving help to a customer. What losses did the candidate or the company sustain because of the candidate’s actions? Did they face a particularly disgruntled customer? How would they handle the same situation differently if faced with it again? Because customer service representatives are often part of a team, use the video interview to also screen employees using team-oriented questions. Has the candidate ever worked as part of a team? How have they worked well with the group or what difficulties have they experienced in getting along with teammates? How would they deal with a fellow employee who was treating a customer poorly? What kind of actions would a candidate take to ensure the entire team was performing at their best and highest level instead of leaving their teammates behind? Customer service positions can be among the most stressful and sometimes difficult jobs in a company. As those on the front lines of delivering the product or service, these employees must have the skills and experience to represent the company well. By taking advantage of the video interview, you can screen potential candidates through a unique medium and gauge them for the skills necessary to be the shining face of your company that customers long to see. 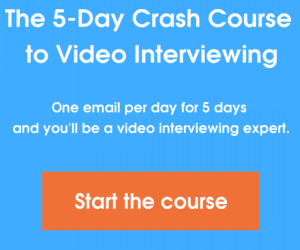 Do you agree that video interviews can help you hire better CSRs? Leave us a comment below!